In this episode, Max Keiser and Stacy Herbert note that the bell has rung for the bond market top as one of the biggest private equity funds in the world is seeking 'ordinary' investors to assume their long term interest rate risk. In the second half, Max Keiser talks to Ian Williams of Charteris Treasury Portfolio Managers about his forecast for silver prices to rise five fold in the next 3 three years while US Treasury bonds and UK gilts will face collapse. Ian Williams also suggests that it is commercial banks rather than central banks that will return us to a new style of gold standard. Are we on the verge of a new credit crunch? Full Show: Too Big to Jail? ... [KR371] Keiser Report: Colossal Collapse Coming! 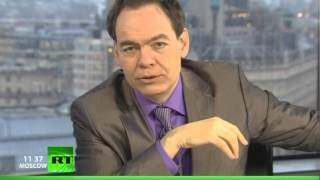 ... [KR371] Keiser Report: Colossal Collapse Coming! ” ‹ Older ... Watch the latest Keiser Reports: Archives. In this episode of the Keiser Report, ... the bank formerly known as Anglo Irish and how it is that the bank came to collapse ... Keiser Report: Colossal Collapse Coming!